The Cisco® 1.2GHz GainMaker® GaN System Amplifier is the latest-generation broadband amplifier in the Cisco GainMaker platform. Gallium nitride (GaN) technology supports RF output levels up to 57 dBmV. The Cisco GaN amplifier (Figure 1) provides one high-level forward RF output. All Cisco GainMaker products share common plug-in accessories and perform to 1.2 GHz in the forward path. Cisco 1.2GHz GainMaker system amplifier modules have increased gain to allow drop-in for 750-MHz spacing and are mechanically compatible with previous Cisco GainMaker System Amplifier 1.0GHz GMLE housing bases, often allowing upgrade to higher bandwidth with no respacing or resplicing. 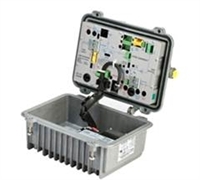 The DC power supply is modular and located in an updated housing lid for easy access. All Cisco 1.2GHz GainMaker system amplifier modules are factory configured with reverse amplifier, diplex filters, thermal compensation circuit, forward interstage pads, and equalizer to promote optimal performance. Optional single-pilot automatic gain control (AGC) configurations are also available. The Cisco® 1.25 GHz Surge-Gap Tap product line is the latest evolution of the HFC network providing full support of the DOCSIS 3.1 standard. DOSCIS 3.1 support will allow MSOs to fully and efficiently utilize their broadband networks to provide the services that their subscribers demand. Support for DOCSIS 3.1 means that the frequency capabilities of the devices is increased to the full 1.218 GHz spectrum as well as full compatibility with the new OFDM signalling requirements. These new capabilities will allow MSOs to increase revenue generation by allowing increased capability across their networks to drive new and improved services to their customer base. In addition to the new DOCSIS 3.1 capabilities, the Cisco 1.25 GHz Surge-Gap Tap product line continues to support IEEE-compliant 6 kV surge protection which provides protection against voltage transients in lightning strike areas and locations with unreliable power networks. 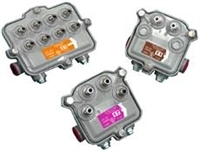 In addition, the Cisco 1.25 GHz Surge-Gap Tap products offer the same “make-before-break” capabilities of previous Cisco tap products, which allow cable technicians to pull the tap’s faceplate and perform maintenance without interrupting service to subscribers located downstream. The Cisco 1.25 GHz Surge-Gap Tap is the latest addition to the Surge-Gap product line aimed at supporting DOCSIS 3.1 network architectures. Cisco 1.25 Surge-Gap Taps are an extended offering of Cisco’s multimedia product family: Standard Profile 2 and 4 port products, as well as the Full Profile 8 port product.